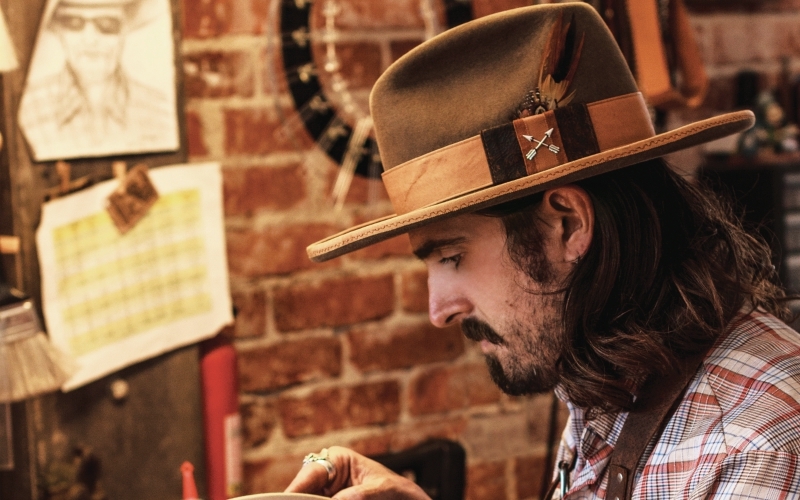 In 2015, rudderless once again, he found himself drawn to an old Stetson. As a kid, Wise loved to dress as a cowboy, in no small part because of the head-gear. “I could be anybody I wanted with a hat,” he says. “In a black hat I’m the outlaw; in a white hat, the Lone Ranger.” Now, as a grown-up, Wise wanted to see how he could transform a Stetson, not the other way around. He switched out the sweatband, reblocked the felt, and swapped parts with scavenged hats.